Ummm — what does our wedding or I (for that matter) have to do with Justin Timberlake? After a quick search I didn’t see anything about him being in a car accident… So, I don’t know who you are or how you got this blog address, I appreciate the hits, but, I’d prefer if I weren’t tied into this type of non-existent hype. Thanks! Now moving on the “real” news of the day… I placed a poll on my Facebook pages, and, asked everyone (who is interested) to vote on where Gary and I should hold our wedding reception. Hands down, The Plaza Hotel in NYC is pulling ahead fast. True — so far only 53 people have voted, but, it was still an overwhelming landslide in favor of The Plaza. And, the more I think about it, the more I’m getting into the idea. So, I made arrangements for Gary and I to meet the wedding coordinator at The Plaza — along with our wedding planner, and, we’ll see if the date we want is open for next week. 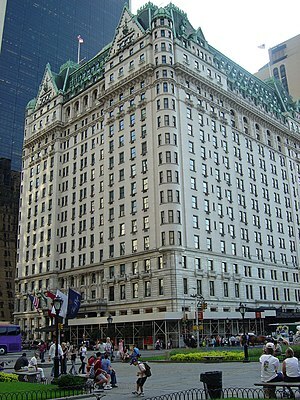 There is just “something” – oh I don’t know – let’s call it nostalgic – about The Plaza Hotel, but, I find it rather romantic. Perhaps because so many great movies where filmed there or just the history of the building, but, it does seem “right”. I’ll keep you posted and hopefully have some photos to share with you all next week so you can see the rooms too 🙂 Have a great weekend everyone!